A baby boy who was in breech presentation but healthy prior to delivery now has hypoxic ischemic encephalopathy (HIE), severe spastic cerebral palsy, microcephaly, intellectual disabilities and developmental delays because he was deprived of oxygen when the medical team mismanaged his breech position. The little boy was diagnosed as being in a breech presentation during a prenatal visit at the Canberra Hospital in Australia. Due to his unstable position, the obstetrician and mother decided to have a scheduled C-section delivery. During a prenatal visit, the obstetrician discovered that the baby had moved out of the breech position and into a normal, head-first presentation. The C-section was cancelled. Not long after her last prenatal visit, the mother rushed to the hospital, claiming she could not feel her baby move. After a long delay, the baby boy was finally delivered by a C-section delivery. He was not breathing at birth and had to be resuscitated and placed on a breathing machine (ventilator). Soon after birth, he was diagnosed with hypoxic ischemic encephalopathy (HIE), which led to later diagnoses of microcephaly, spastic cerebral palsy, and intellectual and developmental disabilities. The mother and her attorneys claim that the baby boy’s injuries could have been prevented if the obstetrician hadn’t cancelled the scheduled C-section delivery and had initiated immediate heart rate monitoring of the baby as soon as the mother arrived at the hospital, with an emergency C-section delivery taking place at that time. Sadly, when the mother arrived at Canberra Hospital complaining that her little boy was not moving, nobody on the medical team acted with a sense of urgency. It is the standard of care to immediately initiate heart rate monitoring of a baby as soon as the mother is admitted to a labor and delivery unit. Yet, nobody attached the monitor to the mother during admission. Heart rate monitoring must also occur if there are any signs that the baby may be in trouble, such as the baby not moving anymore, cramping or vaginal bleeding. There was a long delay in starting fetal heart monitoring. Once the team began monitoring the little boy’s heart rate, they did not quickly deliver him when his heart rate tracings were non-reassuring, an indication that he was being deprived of sufficient oxygen. In fact, the team delayed transferring him to a place that was capable of performing a C-section. When the baby was finally delivered by C-section, he had suffered such severe oxygen deprivation (birth asphyxia) that he was not breathing. Fetal heart rate monitoring is of critical importance. The goal of monitoring the baby’s heart rate is to identify signs that indicate he is being deprived of oxygen so that the obstetrician can quickly deliver him in order to prevent permanent brain damage. Indeed, two of the most important elements in preventing newborn brain damage are 1.) recognizing fetal distress on the heart monitor or a condition that can cause fetal distress, and 2.) performing a quick C-section delivery when distress or impending distress is evident. Of course, when distress is first noted, the medical team may try corrective actions, such as discontinuation of the labor drugs Pitocin and Cytotec or giving the mother IV fluids. While corrective actions are taking place, however, preparations for emergency C-section delivery should begin so the baby can very quickly be delivered if the distress isn’t immediately relieved. The longer delivery is delayed when a baby is in distress, the longer the birth asphyxia will continue, thereby increasing the baby’s risk of having permanent brain damage. The only way a baby can be directly helped is to get him out of the womb and breathing on his own, where the medical team can help him. A breech presentation is when the baby’s legs or buttocks are positioned to exit the birth canal first. There are four different breech positions. Frank breech: This is when the baby’s buttocks present first, and her legs are flexed at the hip and extended at the knees, with the feet near the ears. When a baby is in a breech presentation, a C-section is the safest way to deliver him, and in most types of breech positions, a C-section delivery is required. 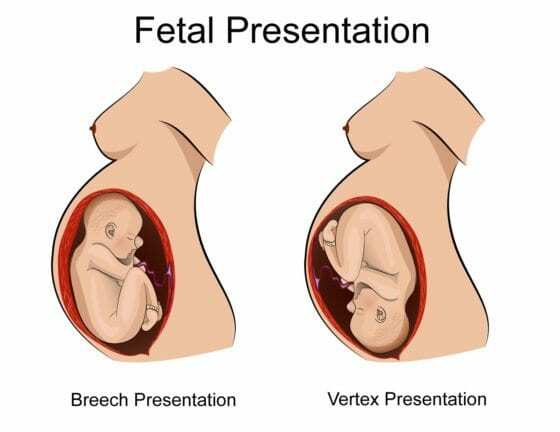 A breech presentation puts the baby at risk of having numerous problems, including a compressed umbilical cord, head trauma, brain bleeds, birth asphyxia and conditions such as hypoxic ischemic encephalopathy (HIE), seizures and cerebral palsy. Breech babies are significantly more likely to die during a vaginal delivery compared to breech babies delivered by C-section, according to a recent study. The study showed that the risk of death was 10 times greater for babies in breech presentation delivered vaginally than for breech babies who had a C-section delivery. Sometimes a breech presentation resolves itself and the baby ends up in the head-first position. These babies still require close monitoring, however, because they are at an increased risk of going back into a breech position. Very serious complications can occur in breech position, such as the umbilical cord being compressed during delivery, which can cause the baby to be partially or completely cut off from her supply of oxygen-rich blood. Umbilical cord compression can be caused by a prolapsed cord, which occurs when the cord descends in front of the baby in the birth canal, or a nuchal cord, which is when the cord is wrapped around the baby’s neck. The umbilical cord is the baby’s lifeline. If it becomes compressed, the baby will experience a lack of oxygen to her brain, called birth asphyxia. Birth asphyxia can cause hypoxic ischemic encephalopathy (HIE), seizures and cerebral palsy. A baby is also more likely to experience traumatic injury during a vaginal breech delivery. As the baby’s head passes through the birth canal, there is an increased risk of trauma to the skull due to the head’s position. The spine and spinal cord can also become injured if the physician does not properly position the baby during birth. In addition, attempts to position the baby can cause brain bleeds and hemorrhages, especially if the head gets caught in the birth canal. These traumatic injuries can cause HIE, cerebral palsy, seizures and other birth injuries. Sometimes forceps are used to help deliver the baby’s head. This is a risky delivery instrument that looks like a pair of salad tongs. If the forceps are not properly placed on the baby’s head, the head can be compressed, spinal cord injury can occur, and vessels in the brain can be torn, causing brain bleeds, hemorrhages, clots and strokes, all of which can cause cerebral palsy. Outside of the baby having a congenital defect, birth asphyxia is the most common cause of neonatal seizures and brain dysfunction disorders, such as hypoxic ischemic encephalopathy (HIE). Birth asphyxia is when the baby experiences a lack of oxygen to her brain during or very close to the time of birth. If a baby is suffering from birth asphyxia, it will be evident on the fetal heart rate tracing. If the obstetrician quickly delivers the baby when distress occurs, the risk of permanent brain damage is minimized. Conditions that can occur during or near the time of birth that can cause birth asphyxia are listed below. Birth asphyxia often causes HIE, neonatal encephalopathy, and periventricular leukomalacia (PVL – usually seen in premature babies). These conditions can cause the baby to have lifelong disorders, such as cerebral palsy, seizures, hydrocephalus, microcephaly, intellectual disabilities and developmental delays. If your child was diagnosed with a birth injury, such as cerebral palsy, a seizure disorder or hypoxic ischemic encephalopathy (HIE), the award winning HIE lawyers at ABC Law Centers can help. We have helped children throughout the country obtain compensation for lifelong treatment, therapy and a secure future, and we give personal attention to each child and family we represent. Our nationally recognized birth injury firm has numerous multi-million dollar verdicts and settlements that attest to our success and no fees are ever paid to our firm until we win your case. 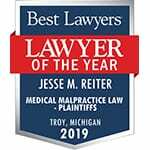 Email or call Reiter & Walsh ABC Law Centers at 888-419-2229 for a free case evaluation. Our firm’s award winning HIE lawyers are available 24 / 7 to speak with you.